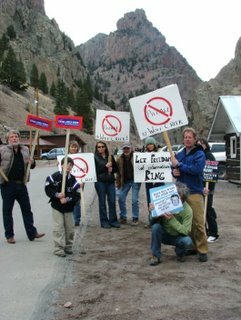 Dozens of protestors opposing the Village at Wolf Creek were met in Creede on Friday, April 7, by an army of police and sheriff’s deputies from nine counties. Forty-five officers from Rio Grande, Pueblo, Alamosa, Conejos, Saquache, Mineral, Hinsdale, Gunnison and Archuleta counties and a command station RV outnumbered protestors three to one. The protests were peaceful and most of those who traveled from Pagosa Springs sat quietly and endured the four-hour presentation by Village developers Bob Honts and Billy Joe “Red” McCombs. The forum, sponsored by the Upper Rio Grande Economic Development Council (URGEDC) was a one-sided presentation. The panel consisted of Honts, McCombs, and Les Cahill, Mineral County Commissioner. Peter Clark, U.S. Forest Service Supervisor for Rio Grande National Forest answered questions from the audience, but refused to sit on the panel. State Representative Mark Larson (R-Cortez) and State Senator Jim Isgar (D-Durango) both boycotted the event along with Davey Pitcher, representative of the Wolf Creek ski area. URGEDC said they did not invite Colorado Wild and the San Luis Valley Ecosystem Council because they are not an owner or public agency involved in the decision making process. URGEDC is a vocal supporter of the Village and their Vice President, Dusty Hicks is a paid consultant for the Village. Hicks was not on the panel. The URGEDC board fielded all questions and decided which were answered and which were not. All questions were submitted in writing and no public comment or outburst was allowed. Because all questions were required to be handwritten, follow-up questions were not possible. Pagosa Springs resident Juana Lee Park was removed from the crowd for speaking out and telling Mr. Honts and McCombs that they were ignoring the effects their development would have on Archuleta County. She was escorted from the standing room only 275 capacity meeting room by a Mineral County sheriff’s deputy. URGEDC claims that all questions were answered, except those that duplicated questions already asked, but following the four-hour meeting people were asking Jon Boyd, URGEDC president and moderator of the forum, why their question had not been asked. 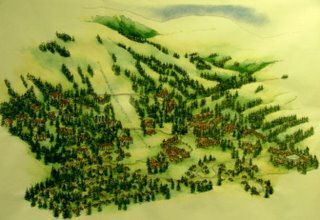 The developers had charts, graphs and renderings of the Village and were prepared to answer every question. Cahill traced the history of the development and said that the density of the project had always been over 2,000 units. “The original application by Leavell-McCombs in 1986 was for 2,151 units. The new application in 1999 was for 2,172 units,” Cahill said. Later, Honts said: “We will never build all 2,172 units.” But he went on to say: “I wouldn’t take Mr. McCombs statement as pessimistic. I have never seen a man that could sell better than Red McCombs.” Honts said that together he and McCombs would invest over $100 million during the first phase of the development. However, Town Manager Mark Garcia told the SUN that the Town did not receive any feedback from Mr. Honts regarding their resolution. The County could not confirm any official correspondence or response from the developer either concerning their resolution. However, it appears that many of the issues raised by the Town of Pagosa Springs and Archuleta County are somewhat addressed in the EIS Appendix A.
Mr. Honts stated that the Village would have no negative fiscal impact on Mineral County and that the only impact would be on employee housing, but that the influx of workers would be a tax boon and a sales tax boon for Rio Grande, Mineral and Alamosa counties. He also stated that the impact on the Alamosa airport would be substantial. He claimed that Archuleta and Rio Grande counties were courting the Village developers for the health care contracts. Honts pointed out that an appendix to the EIS includes projected economic impacts based upon an IMPLAN model result. In year six, the IMPLAN model suggests that tax revenues from construction and operations in the tri-county area will peak at nearly $23 million and that the project will provide 3,700 new jobs. Honts announced that the Village at Wolf Creek will include a major university conference center and said they will soon unveil plans for a golf course either east or west of the Village, but most likely in Rio Grande County. However, according the IMPLAN model and the EIS the development which is now outlined to include 120 single family homes, 1,600 timeshare units, 400 condominiums, 6 hotels with a total of 1,100 rooms, 4 bed and breakfasts, 141,700 square feet of multi-family units and a maximum of 222,100 square feet of commercial space, impacts will be felt in Archuleta County. workers with families is 239 new school-age children. Mineral County schools are already operating beyond capacity. Rio Grande County schools have some capacity, as do some Archuleta County schools. “Finding enough financial assistance to make the necessary changes to accommodate the new students could prove challenging,” the EIS states. As part of the ruling, Kuenhold decreed that once the developer obtained adequate year-round access and received a Colorado Department of Transportation permit to access U.S. 160, they could seek re-approval of their final plan from Mineral County. With the EIS complete, step one of Kuenhold’s mandate is essentially complete. According to the EIS, year-round access, and the main access point to the Village, will be provided by the construction of a new 750-foot road called Snowshed Road. The second access point is a 250-foot extension to the existing Tranquility Road, which will provide access between the ski area and the village. The Wolf Creek Ski Corporation will pay to complete the 250-foot Tranquility Road extension, in spite of the fact that they are involved in litigation with the developer of the Village. Honts estimated that the Snowshed Road would cost the developers an additional $10 million dollars. Mr. Honts also stated that the NEPA process and EIS cost the Village $2.5 million. Honts and Peter Clark both vehemently denied any wrongdoing, political pressure or special treatment. “The decision is mine and I own it,” Clark said. April 22, 2006 in ART.